SpatiulConstruit.ro (BuildingSpace as it would be in English) is the leading Romanian website for architecture and building professionals searching for suppliers and products. It’s about bringing people together to share ideas and inspiration. SpatiulConstruit.ro is being used by architects, interior designers, landscapers, engineers, developers, architecture students, craftsmen, project managers or end users, offering valuable information to anyone interested in constructions,design, art, architecture and urbanism. 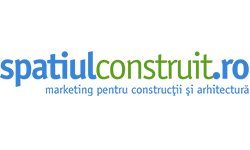 Today, SpatiulConstruit.ro is the most appreciated professional portal for construction and architecture industry in Romania. Our team started in 1998 under the name of BICAU.RO (Bank of Information in Constructions, Architecture and Urbanism) a dedicated portal for the Romanian architects, developed by our company in partnership with Ion Mincu University of Architecture and OAR Bucharest (Order of Architects). In 2011, following a rebranding process, we became SpatiulConstruit.ro Consequently, our audience increased from 30,000 unique visitors/month to 150,000 unique visitors/month, ranking in the top 100,000 websites of all existing 1 billion worldwide (according to Alexa.com, the global pioneer in the world of analytical insight, developed by Amazon.com in 1996). Annually, we offer our marketing services to more than 500 national or international companies, generating online inquiries worth over 100 mil euros. SpatiulConstruit.ro is everything you need for constructions and architecture in one place!